Dwemer (also known as Dwarven) armor and weapons, though heavier than steel, are highly sought after for their resistance to corrosion, unmatched craftsmanship, their ability to keep an edge, and even just for their rarity. Dwarven items have not been produced since the disappearance of the Dwemer long ago and are truly a treasure whether in the battlefield or on display. Dwemer armor is most commonly found in Dwemer Ruins, though it is seen elsewhere as well: Somewhat complete sets are among others worn by Rimintil, Hlaren Ramoran, Farvyn Oreyn, Mollimo of Cloudrest and the guards of Venim Manor. 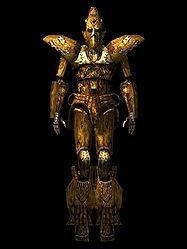 According to some sources, Dwemer armor is actually the outer plating of Dwemer Centurions and other Dwemer machines. This view is reflected in the book The Ruins of Kemel-Ze. However, other sources seem to indicate that it was specifically intended as armor to be worn by the Dwemer themselves. An example of this is the story of Chimarvamidium. Additionally, the discarded armor pieces found near piles of ash in Bamz-Amschend in the Tribunal expansion seem to support this theory. This page was last modified on 12 April 2017, at 03:01.